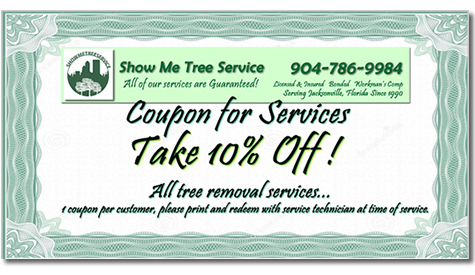 Call for a Free Estimate: (904) 379-5843Show Me Tree Service is delighted to be able to extend our stump removal and grinding services to all local businesses, property owners, and districts in the Jacksonville Florida area, including Orange Park. After a tree removal in Jacksonville, you are still left with a stump that can detract from the rest of your carefully landscaped lawn or property. 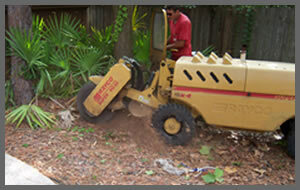 Professional stump removal and grinding is the safest, easiest and fastest way to get rid of stumps from the area. Once trees have been cut down, we can finish the job with our stump grinding service. This helps to avoid damage to your lawn care tools and adds an extra sense of convenience to your property. The National Arborists will tell you that if you have left a stump on your lawn or property without having ground it down it could make the other trees in the area become infected. Tree fungi has been known to spread to stumps that have been left unattended to, which will then infect the soil and potentially healthy trees if they are wounded. The tree care professionals at Show Me Tree Service have been schooled in the use of expert grade stump grinders. This particular tool is made to grind the tree stump and roots away utilizing sharp cutting teeth. The grinder will be lowered very slowly in a back and forth movement across the stump to turn an ugly blemish on your property into mulch or wood chips that you can use for landscaping. Why engage a professional stump removal service? While you may be able to rent and utilize stump removal and grinding equipment and finish the job by yourself, this can prove to be a very arduous, backbreaking and expensive endeavor. Not to mention that after the stump is out, you will still have the issue of removing the wood chips that are left. Many people who have tried to utilize the stump grinding and removal equipment on their own have found that they do not achieve a measure of success. Most of the time this happens because they do not know the proper techniques for using the equipment and then they have the double expenditure of the rental as well as hiring a professional removal service. By engaging Show Me Tree Service you will have saved yourself a lot of hard labor from attempting to rent and operate a stump grinder yourself. 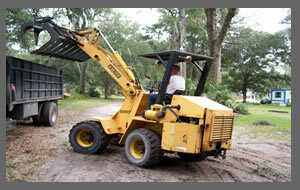 If you have a stump in need of removal, or even need some assistance with your bush hogging needs, call our tree service Jacksonville FL office today. We will be happy to schedule a consultation on your schedule, and will provide you with a professional quote on the cost of your stump grinding service.